By Gavin Drake and originally posted on the Anglican Communion News Service – Re-posted with permission. A group of South Sudanese expatriates living in the US have met to discuss “obstacles and the foundations for reconciliation and peace-building” in their native land. In a message to other ex-pats issued at the end of the conference organised by the American Friends of the Episcopal Church of the Sudans, they said: “We realised our need for a stronger and more unified voice.” And they are calling on other South Sudanese in North America to unite for peace. The statement described the meeting as “a profound encounter in which we recognised both the burden of trauma that we share and the strength that comes out of our diversity. “We explored the obstacles and the foundations for reconciliation and peace-building. We realised our need for a stronger and more unified voice. We now extend to you an invitation to be part of a stronger and unified voice for the conscience and heart of the entire South Sudanese diaspora in North America. 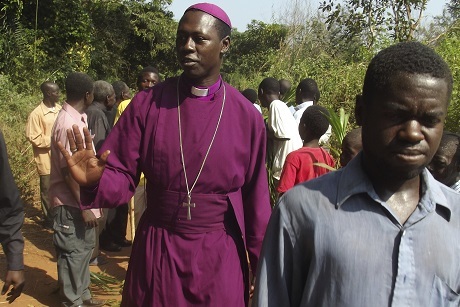 The Bishop of Nzara, Samuel Peni, chairs the Episcopal Church of South Sudan’s commission for peace and reconciliation. Addressing the gathering, he said that the bishops in South Sudan – like all people in the country – are traumatised by years of civil war. Concluding his address, he said: “We have work to do. We have to ask ourselves why our nation does not show Christian values when 80 per cent of our people declare themselves as followers of Jesus. We demonstrate corruption, violence and tribalism and all these are against the Christian way. The Revd Canon Phil Groves, who led the Anglican Communion’s Continuing Indaba project for 10 years before returning to parish ministry in 2016, described the event as “one of the most significant conferences I have ever attended.” He was one of the facilitators for the conference, alongside Jane Namurye, the wife of Bishop Anthony Poggo, a former South Sudanese bishop who now serves as the Archbishop of Canterbury’s advisor on the Anglican Communion. The warring parties in South Sudan are due to meet for a resumption of peace talks in Addis Ababa next week (17 May). This week, South Sudan’s first vice president, Taban Deng Gai, announced that he was rejoining the government and that his Sudan People’s Liberation Movement – In Opposition (SPLM-IO) had been dissolved. This will strengthen the hand of South Sudanese President Salva Kiir at the peace talks, but there are still a considerable number of other opposition groups; including those loyal to former Deputy resident Riek Machar.